The cell is the basic unit of all life forms. Some living organisms are made up of a single cell, while others are made up of an enormous number of cells. For example, the human body is made up of 10,000,000,000,000 cells. Most cells are extremely tiny and you can only see them with a microscope. Cells are specialised to perform certain functions in plants and animals. For example, at the time you read these words, the nerve cells in your eyes are carrying messages of what you are reading to the brain cells, and the muscular cells connected to your eyeballs are moving your eyes across the page. Cells are collected together to form tissues, such as the nerve tissue or muscular tissue. In turn, the different types of tissues form organs such as the eyes, heart and lungs. All the cells, whether they are specialised or unicellular organisms, share general characteristics. Each cell respires, feeds, gets rid of waste, grows, reproduces (produces similar cells) and finally dies after a certain period of time. The cells can perform all of these functions because they have special structures called ‘cell organelles’, where each organelle is specialised for performing a certain function. For example: Let’s imagine you are a pancreatic cell. Your job is to secrete digestive enzymes, which travel into the small intestine and help break down nutrients from food. In order to carry out this job, you somehow have to get those enzymes shipped from their site of synthesis—inside the cell—to their place of action outside the cell. How are you going to make this happen? After a moment of panic in which you consider calling the postal service, you relax, having remembered: I have an endomembrane system! Eukaryotes are organisms composed of cells that have their genetic material surrounded by a nuclear membrane, the nucleus, as well as a number of other membrane-bound organelles that carry out cellular functions. The eukaryotic cell’s endomembrane system is a network of organelles (like little organs) involved in manufacturing and material transport, allowing the cell to make, move and break down cellular products. The endomembrane system consists of the nuclear envelope, rough and smooth endoplasmic reticulum (ER), the Golgi apparatus as well as the cell’s plasma membrane, and includes the vesicles that bud off these membranes for intracellular transport (moving stuff around inside the cell), exocytosis (stuff leaving the cell) and endocytosis (stuff coming into the cell). The endoplasmic reticulum (ER) plays a key role in the modification of proteins and the synthesis of lipids. It consists of a network of membranous tubules and flattened sacs. The discs and tubules of the ER are hollow, and the space inside is called the lumen. The rough endoplasmic reticulum (rough ER) gets its name from the bumpy ribosomes attached to its cytoplasmic surface. As these ribosomes make proteins, they feed the newly forming protein chains into the lumen. Some are transferred fully into the ER and float inside, while others are anchored in the membrane. Inside the ER, the proteins fold and undergo modifications, such as the addition of carbohydrate side chains. These modified proteins will be incorporated into cellular membranes—the membrane of the ER or those of other organelles—or secreted from the cell. If the modified proteins are not destined to stay in the ER, they will be packaged into vesicles, or small spheres of membrane that are used for transport, and shipped to the Golgi apparatus. The rough ER also makes phospholipids for other cellular membranes, which are transported when the vesicle forms. Since the rough ER helps modify proteins that will be secreted from the cell, cells whose job is to secrete large amounts of enzymes or other proteins, such as liver cells, have lots of rough ER. Synthesis of carbohydrates, lipids, and steroid hormones. Detoxification of medications and poisons. In muscle cells, a special type of smooth ER called the sarcoplasmic reticulum is responsible for storage of the calcium ions that are needed to trigger the coordinated contractions of the muscle cells. When vesicles bud off from the ER, where do they go? Before reaching their final destination, the lipids and proteins in the transport vesicles need to be sorted, packaged, and tagged so that they wind up in the right place. This sorting, tagging, packaging and distribution takes place in the Golgi apparatus (Golgi body), an organelle made up of flattened discs of membrane. The receiving side of the Golgi apparatus is called the ‘cis face’ and the opposite side is called the ‘trans face’. Transport vesicles from the ER travel to the cis face, fuse with it and empty their contents into the lumen of the Golgi apparatus. As proteins and lipids travel through the Golgi, they undergo further modifications. Short chains of sugar molecules might be added or removed, or phosphate groups attached as tags. Carbohydrate processing is shown in the diagram as the gain and loss of branches on the purple carbohydrate group attached to the protein. Finally, the modified proteins are sorted (based on markers such as amino acid sequences and chemical tags) and packaged into vesicles that bud from the trans face of the Golgi. Some of these vesicles deliver their contents to other parts of the cell where they will be used, such as the lysosome or vacuole. Others fuse with the plasma membrane, delivering membrane-anchored proteins that function there and release secreted proteins outside the cell. Cells that secrete many proteins, such as salivary gland cells that secrete digestive enzymes or cells of the immune system that secrete antibodies have many Golgi stacks. In plant cells, the Golgi apparatus also makes polysaccharides (long-chain carbohydrates), some of which are incorporated into the cell wall. The lysosome is an organelle that contains digestive enzymes and acts as the organelle-recycling facility of an animal cell. It breaks down old and unnecessary structures so their molecules can be reused. 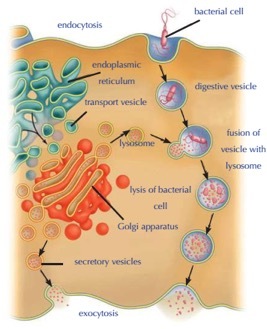 Lysosomes are part of the endomembrane system, and some vesicles that leave the Golgi are bound for the lysosome. Lysosomes can also digest foreign particles that are brought into the cell from outside. As an example, let’s consider a class of white blood cells called macrophages, which are part of the human immune system. In a process known as phagocytosis, a section of the macrophage’s plasma membrane invaginates (folds inward) to engulf a pathogen, as shown below. Plants cells do not have lysosomes. Instead, they have another type of organelle called the vacuole. The large central vacuole stores water and wastes isolates hazardous materials and has enzymes that can break down macromolecules and cellular components, like those of a lysosome. One point that can be confusing is the difference between lysosomes and peroxisomes. Both types of organelles are involved in breaking down molecules and neutralising hazards to the cell. Also, both usually show up as small, round blobs in diagrams. However, the peroxisome is a different organelle with its own unique properties and role in the cell. It houses enzymes involved in oxidation reactions, which produce hydrogen peroxide as a by-product. The enzymes break down fatty acids and amino acids, and they also detoxify some substances that enter the body. For example, alcohol is detoxified by peroxisomes found in liver cells. Importantly, peroxisomes—unlike lysosomes—are not part of the endomembrane system. That means they don’t receive vesicles from the Golgi apparatus. You can learn more about how proteins are shipped to the peroxisome in the article on protein targeting.